Gov. 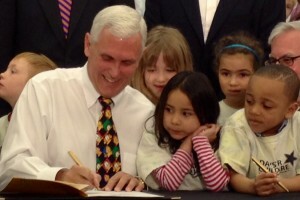 Mike Pence signs legislation creating a state-funded preschool pilot program. The Family and Social Services Administration (FSSA) today announced 18 counties as finalists for the state’s new pre-k pilot program. Allen, Bartholomew, Delaware, Elkhart, Grant, Howard, Jackson, Kosciusko, Lake, Lawrence, Madison, Marion, Noble, St. Joseph, Tippecanoe, Vanderburgh, Vigo and Wayne. Melanie Brizzi, Child Care Administrator at the FSSA, says the legislation that created the pilot program required the 18 counties be dispersed throughout the state and have a mix of urban and rural cities within the county. Brizzi says the proposal to be chosen for one of the five final counties gives the FSSA more information that just data and statistics. “Tell us about your past commitment to early education, tell us what else is going on in your county, tell us what your plan is for participating in fundraising activities or parental engagement,” Brizzi said. Board member Tony Walker represents Lake County, which includes Gary, and says he is ecstatic this community was chosen as a semi-finalist. The selected counties have an estimated 17,000 eligible four-year-olds currently not enrolled in a pre-k program. The final five counties are expected to be chosen by July 2014, and the program is expected to be fully launched by July 2015.